This area of Earl's Court was developed between 1852-62, prior to which it was fields. Probably the smallest garden square in the borough, this communal garden was provided for residents of Sunningdale Gardens, sandwiched between the terraces either side and blocked off at one end. Its layout today probably dates from the 1930s, with informal planting, a metal arch with roses, decorative lamp post and paving. Has taken part in Open Garden Squares Weekend 17 times, most recently in 2014. Tube: Earls Court (District, Piccadilly); High Street Kensington (District, Circle). Bus: 9, 10, 27, 28, 49, 328, 74. Development here followed the earlier developments nearby such as Edwards Square and Pembroke Square (q.q.v) and ribbon development along the main road, later Kensington High Street. This terrace was originally called Cleveland Terrace Gardens and was developed at the same time as other late Victorian terraces such as Abingdon Road Terraces. The terraces of Sunningdale Gardens are described as 'one of the most accomplished examples of this style, having a selection of the many interesting decorative features still in good repair' (RBKC Edwardes Square Scarsdale and Abingdon Conservation Area Policy Statement). The small communal garden is sandwiched between the terraces either side and blocked off at the end. Sunningdale Gardens is probably the smallest square in the borough. It is owned by the freeholders and maintenance is carried out paid for with precept charged as part of RB Kensington and Chelsea council tax. Layout of the current garden and paths probably dates from the 1930s, with informal planting and a metal arch with roses, decorative lamppost and paving, creating the atmosphere of a country garden. 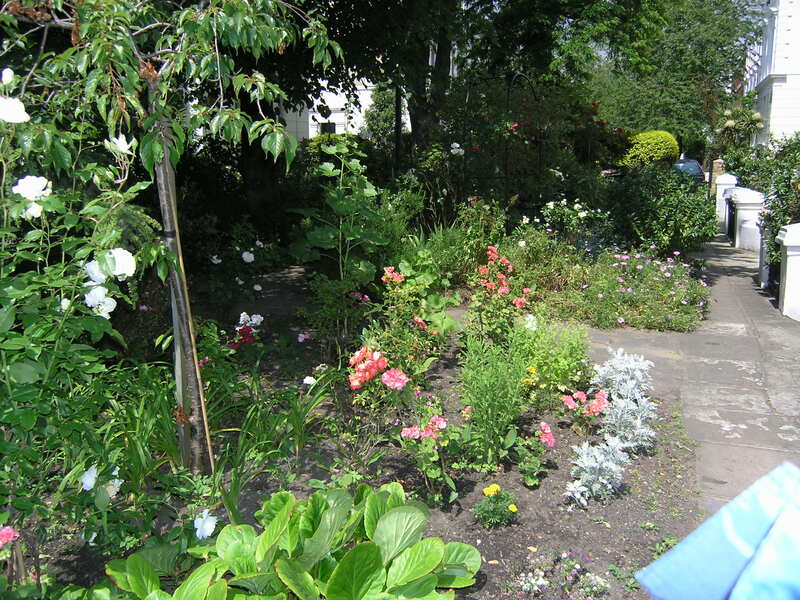 In 2002 it won the Community Effort Cup awarded by RB Kensington and Chelsea, a 'reward for E F Benson-ish neighbourly spirit as much as horticulture' (London Garden Squares Day booklet, 2002). It enjoys the historic right to graze pigs, not lately exercised.